he GVSU Formula Racing Team consists of 35 members from a variety of different academic programs including engineering and business. 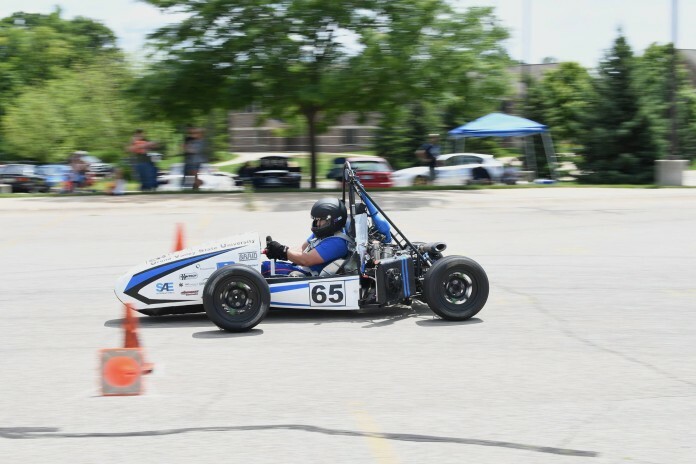 GRAND RAPIDS, Mich. — When people steer their way to the Michigan International Auto Show this weekend in Grand Rapids, they will have the opportunity to see a racing vehicle designed and built by students from Grand Valley State University. Students are part of an exhibition of student-made cars at the West Michigan Society of Automotive Engineers booth. Student volunteers are on hand to answer questions during the show at DeVos Place, which ends February 4. The GVSU Formula Racing Team consists of 35 members from a variety of different academic programs including engineering and business. Each year, the team competes at one of the world’s largest collegiate autocross car competitions at the Michigan International Speedway. The competition takes place May 9-12 this year.